Even when he’s not the center of attention — supposedly — Donald Trump finds a way, even when it’s not of his own volition, to become the center of attention. 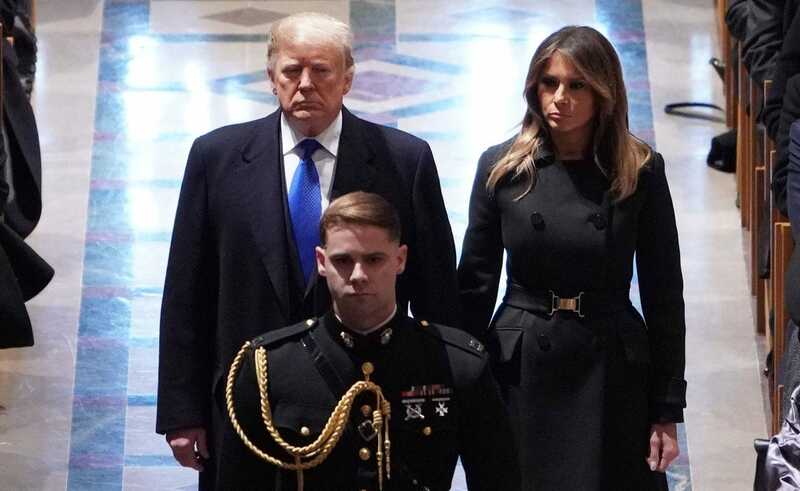 There he was Wednesday morning sitting in a church pew next to his wife, first lady Melania Trump, along with the three surviving presidents and their wives. He sat in the pew with his arms crossed. He didn’t recite the opening prayer along with the rest of those gathered to honor the life of the late President George H.W. Bush; nor did he recite the Apostles Creed along with his wife and the other presidents. The Twitter Universe is abuzz with comments about it. Yes, it’s about Donald Trump. The comparisons to Bush 41 are inevitable. All those who eulogized the great man spoke of his humility, his dedication to public service, his empathy, his humanity, his steady and confident leadership while the Cold War came to an end, his self-deprecation. How can one not think of Donald Trump when one hears the statements made about one of his presidential predecessors? I could not help myself. Neither, apparently, can millions of other Americans. Bush 41 is going to be saluted once again later today in Houston. Then he’ll be placed on a train and will ride the rails to his burial site in College Station, at his presidential library, where he will lie next to his beloved wife, Barbara, and their toddler daughter, Robin. We’ll hear more wonderful rhetoric about the glorious life this man led and we’ll hear more about the qualities that made him such a good and decent man. And to be sure, there will be more not-so-kind thoughts about the fellow who occupies the office President Buch once did with grace and dignity.